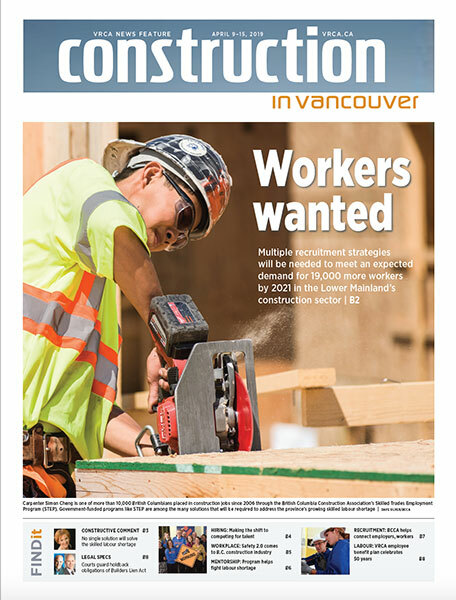 As a $16 billion dollar industry, construction provides 8.6% of B.C.’s wealth and employs more than 225,000 men and women, making it the largest employer in B.C.’s goods sector. In addition to its size and impact, the industry has some key milestones on its horizon. It is expected to face a skilled labour shortfall of approximately 15,000 jobs by 2026. By 2032, the industry will be building carbon neutral buildings. By 2041, one million people are expected to have moved into Metro Vancouver. Such pressures will require the industry to build faster, cheaper, greener and more productively than ever before. Therein lies the challenge and the opportunity that inspired VRCA’s 2017-2020 strategic plan. Leveraging our 90-year history and with a targeted focus on supporting our members and the future, we plan to elevate to a new level VRCA’s industry roles – to Educate, Advocate and Facilitate – through the evolution of current, and the development of new programs and services, that harness opportunity and address challenge. Foster a culture of continuous learning across the industry by providing world-class technical and non-technical education and training. Foster an environment that encourages collaboration, innovation and adoption of standard practices in order to facilitate fair, open and transparent business practices across the industry. Enable connections and opportunities across the industry by providing a range of business-oriented programs, services and support that include first-class networking opportunities. At VRCA, we consider ourselves an extension of your team and are passionate about your success. Vancouver Regional Construction Association officially began as the Building and Construction Industries Exchange of B.C. in 1929. Vancouver Regional Construction Association’s team consists of a dynamic group of professionals.